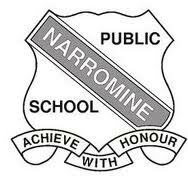 Narromine is located about 40 kilometres west of Dubbo. It is the centre of Narromine Shire. At the 2011 census, Narromine had a population of 3,789. The area is a popular area for gliding and the growing of citrus fruits. The Macquarie River passes through the town. The main road from Dubbo to the west also passes through, this being the Mitchell Highway. The area is characterised by hot summers and mild winters.